How many bites of a food do you usually take? Do you inhale your food? Is your food gone in 5 minutes or less? Are you practically swallowing your food whole? We're not used to focusing on simply eating in our society. It's crazy actually. Most of us look forward to our meals, but then we rush right through them without really tasting or savoring them. Chewing is one of the first steps of digestion. We have teeth for a reason - to chew, chew, chew our food. Chewing begins to break-down our food and helps the rest of our digestive system do its work. Chewing coats your food with saliva to help it go down easier. It's a much better solution than chugging water with each bite. Chewing stimulates enzymes that help us begin to digest the starches in carbohydrates and dietary fats. It physically breaks food into smaller particles, and this larger surface area helps the stomach acid and digestive enzymes work to fully digest your food. Chewing your food also helps digest the vitamins, minerals, and nutrients, so you can absorb them. Remember: You are what you digest and absorb, not simply what you eat. If you inhale your food, you won't get all the wonderful nutrients from it. Chewing sends the signal to prepare your stomach and digestive system for food, so it can stimulate stomach acid and digestive enzymes. If you have large particles of food floating through your digestive system, you may be at risk for a food intolerance, especially if you have an autoimmune condition or leaky gut. Chewing helps break food into small pieces, so your stomach can digest the proteins rather than having whole, undigested proteins. These large particles of food can also become food for bacteria and contribute to bacterial overgrowth or just lots of gas in your system. It's fermentation in your gut! When we chew our food well, we can taste and savor it. The first bite of a cracker may be crunchy and salty. After a few bites, the enzymes work on the starch, and you'll notice it begin to sweeten and soften. Most people report that the first few bites are the best, and people who overeat may be searching for the flavor, taste, and spark of that first bite. Instead, chewing helps you savor the whole array of tastes and textures in each bite. When you focus on chewing your food well during each bite, you'll begin to notice new tastes or textures you never paid attention to before. When you're eating chocolate, for example, you can stop and notice how much satisfies you. You may feel completely satisfied by 1 or 2 bites when you truly chew it and taste all the flavors and textures. Chewing food slows down our eating. When you actually have to stop and chew your food until it's soft, your meal may double or triple in time. Your brain will have a chance to catch up and send out the signal when it's feeling full, or if it's still hungry. When you scarf down a meal in 5 minutes, you'll probably still be full and go back for seconds only to end up stuffed a half-hour later. When you take the time to chew your food, you'll be able to listen to your hunger or fullness cues. If you're still hungry after eating slowly and chewing well, go back for seconds! Just chew them well. Chewing and eating slowly may help you eat less. One study found taking smaller bites and spending more time chewing decreased the subjects' food intake. You may find yourself satisfied with less food as well. Eating slowly also slows down the pace of your life. Making time to have a meal that lasts 30-60 minutes can be a much-needed break during your day. 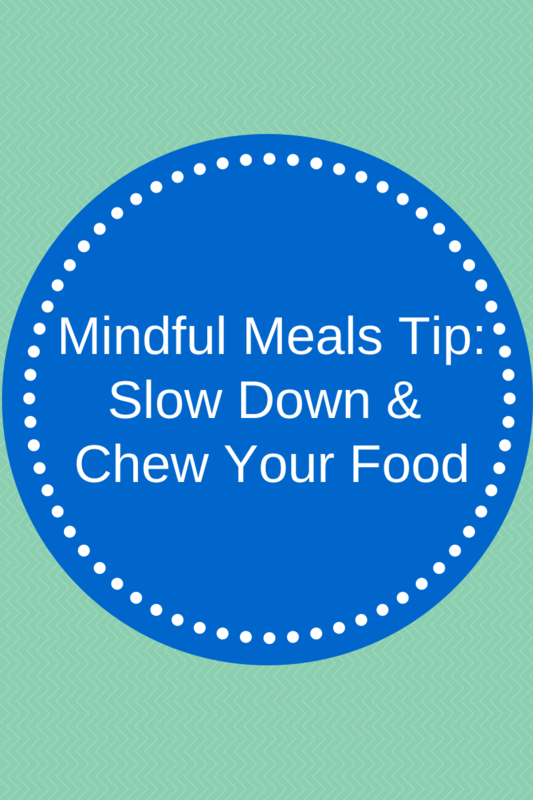 Eating it mindfully can let your mind slow down from the busy, go-go-go day you may be having. Start at your next meal or snack. Pay attention to how you are eating without trying to eat slowly. How big are your bites? Do you swallow large pieces of food? How long is your meal or snack time? Do you taste your food? Can you tell the texture of your food? By paying attention to these aspects of eating, we can learn a lot about our behaviors at mealtimes. Then, at your next mealtime, sit down at a table, and focus on chewing your food. Chew your food until it softens and becomes mush in your mouth. Notice any new flavors or textures that pop up. Put down your fork in between bites while you are chewing. This helps you resist the urge to swallow and move onto the next bite. At your next bite, notice if there are any other new flavors, textures, or thoughts about this food. Does it taste as good as the first bite? Stop eating when you are full, or satisfied with that food. Putting down your fork or spoon can really help slow down your eating. Some people find that eating with chopsticks helps as well because most people aren't used to using them. Give it a try! Remember: My 30-Day Mindful Eating challenge starts on November 25. Sign up for a FREE email series with daily tips HERE! How fast do you eat at mealtimes?